Ricky D'Ambrose's debut feature, Notes on an Appearance, calls to mind the cryptic, non-mystery aesthetic of Michelangelo Antonioni's L'avventura, the answers to our questions mattering less that than the journey that brought them to us. However, unlike Antonioni's film, I'm not completely convinced that there's really as much beneath the surface as the film lets on. 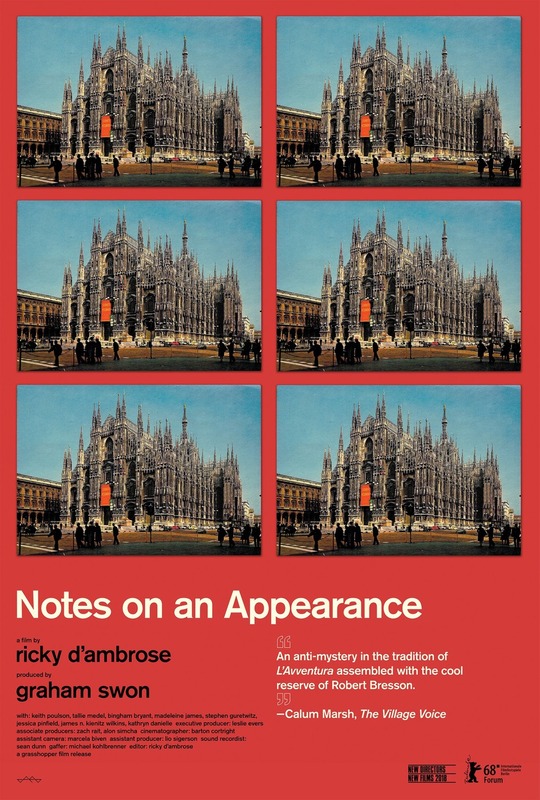 The mystery of Notes on an Appearance surrounds the disappearance of a young man named David (Bingham Bryant) amid a sudden interest in violent fascist ideology. As his friends attempt to track him down, they are left with only scraps of paper, notes, and calendar entries, accompanied by quotes from a fascist philosopher named Stephen Taubes (Stephen F. Cohen) whose death has created a resurgence in his own popularity. Where the young man went is ultimately beside the point as his friends begin to peel back the layers of a reprehensible ideology, and the search eventually begins to take a personal toll on them all. 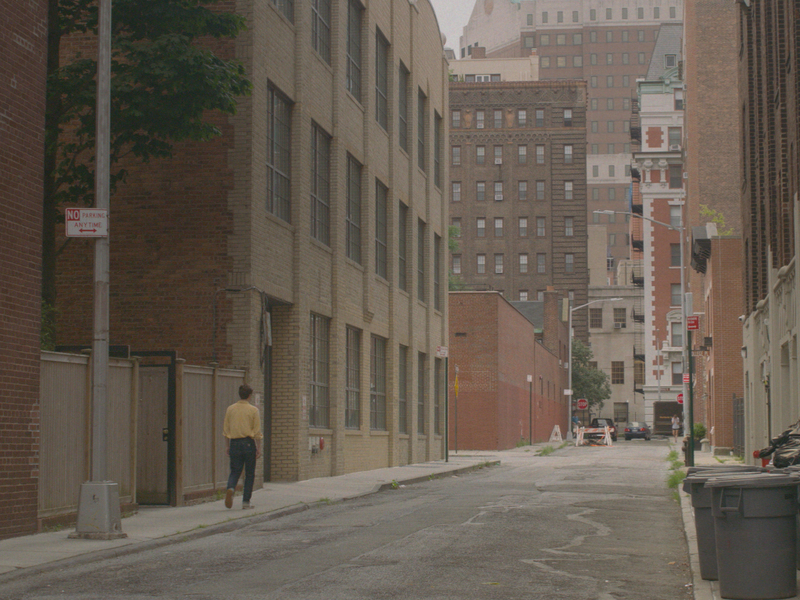 D'Ambrose's narrative economy is impressive, turning the milieu of its bustling NYC locations into lonely, alienating spaces - where the presence of millions of people doesn't negate the societal disconnect felt by so many. Each shot is tightly controlled and precisely composed, drained of all emotion and distilled to its most basic essence. What are the characters saying? What are they really trying to convey? 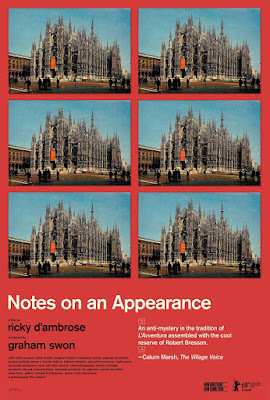 D'Ambrose focuses not on the main action, but rather on objects in the periphery - cups of coffee (filled and unfilled), journal entries, photographs, answers hiding in plain sight but never fully acknowledged. Subtle shifts in surroundings signify greater paradigm changes in the world around them, inserted into the frame at regular rhythms designed to condition the audience then disrupt the familiar routines when they're gone. It's this kind of attention to detail that makes Notes on an Appearance so fascinating, and yet it often feels more like an academic exercise than a fully formed cinematic experience. D'Ambrose is experimenting, pushing boundaries, exploring the cinematic space with a Bresson-like austerity and an ear for conversation and narrative construction that recalls Matías Piñeiro (Viola, Hermia & Helena). This is cinema stripped of all excesses, quiet, observant, and haunting. And yet it seems to speak more to its filmmaker's own innate potential than it does to its own merit. It feels like a practice run for something bigger, a 60 minute exercise in form and craft that's easier to respect than it is to like. And yet, one can't help but be fascinated by what D'Ambrose is attempting here. It is what the filmmaker refers to as a "scrapbook movie" made up of scraps of paper, unfinished ideas, and impressions; "a clunky ensemble vehicle about a handful of young people collectively living out the consequences of a discredited worldview" to quote D'Ambrose's director's statement. There's just something about the entire affair that seems completely timely, even though it was eight years in the making, speaking to a kind of generation ennui felt at a time when violent ideologies are rearing their ugly heads. It's a perplexing time to be alive, and Notes on an Appearance captures that dazed and confused sense of discord and aimlessness that so indelibly describes life in 2018. And if it comes off as self-consciously controlled, it's only because it is an attempt to make sense of a world that does not and can not make sense, as if it was assembled from puzzle pieces that just don't quite fit. 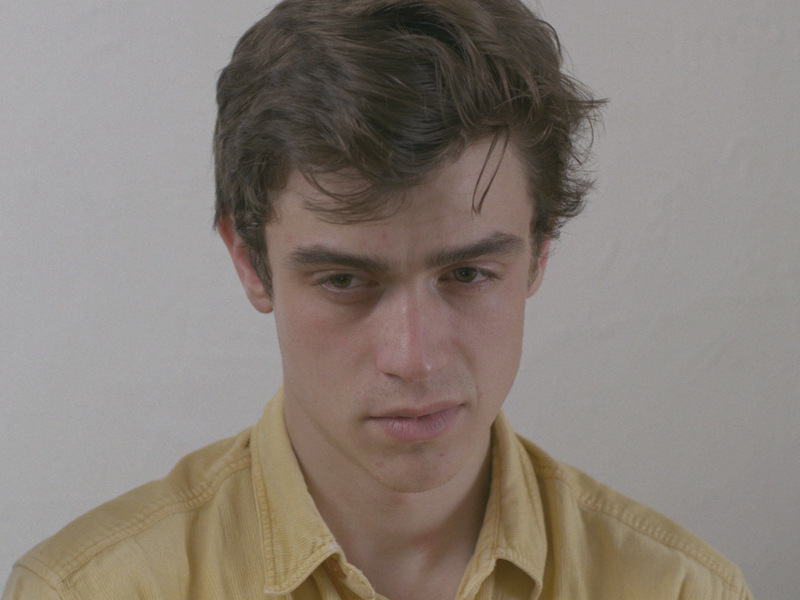 D'Ambrose is clearly a filmmaker to watch, whose ideas and musings, much like Bresson's, are inexorably tied to film form in such a way that finds emotional truth through stylistic distance. Consider this writer's interest piqued. NOTES ON AN APPEARANCE | Directed by Ricky D'Ambrose | Stars Keith Poulson, Tallie Medel, Bingham Bryant, Madeleine James, Kathryn Danielle, A.S. Hamrah | Not rated | Now playing in select theaters.